Mt. Tambora eruption, West Nusa Tenggara, Indonesia. Severe impact on global temperatures post-eruption, causing a drop by as much as 3°C. Mt. Krakatoa eruption, located between the islands of Sumatera and Java, Indonesia. Caused the deaths of over 36,000 people (approximately). 7.9M Earthquake in Moro Gulf, the Philippines. Displaced around 40,000 families and caused more than 1,400 deaths. Mt. Pinatubo eruption, the Philippines. Affected 20 out of 24 provinces with a total of 31,314 families displaced. 9M Earthquake and Tsunami, Indian Ocean. Indonesia, Thailand, Myanmar, Malaysia and other countries outside the ASEAN region were affected. Over 260,000 deaths and almost 2 million people displaced. 8.6M Earthquake, Nias island, Indonesia. 5,700 dead and tens of thousands injured. Southern Leyte mudslide, the Philippines. Over 140,000 deaths and approximately 2.4 million people affected. 7.6M Earthquake in Padang, Indonesia. Tropical Storms Haima and Nok Ten, Lao PDR. The first storm led to flooding in 12 out of 17 provinces, affecting 429,954 people nationwide. South-east Asian Floods in Cambodia, Lao PDR, Malaysia, Myanmar, the Philippines, Thailand, Viet Nam. 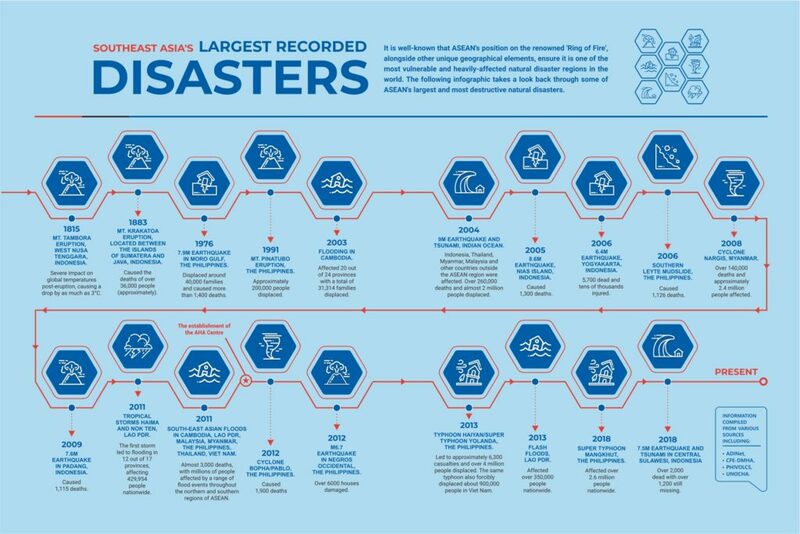 Almost 3,000 deaths, with millions of people affected by a range of flood events throughout the northern and southern regions of ASEAN. M6.7 Earthquake in Negros Occidental, the Philippines. Typhoon Haiyan/Super Typhoon Yolanda, the Philippines. Led to approximately 6,300 casualties and over 4 million people displaced. The same typhoon also forcibly displaced about 900,000 people in Viet Nam. Affected over 350,000 people nationwide. Super Typhoon Mangkhut, the Philippines. Affected over 2.6 million people nationwide. 7.5M Earthquake and Tsunami in Central Sulawesi, Indonesia. Over 2,000 dead with over 1,200 still missing. Information compiled from various sources including: ADINet, CFE-DMHA, PHIVOLCS, UNOCHA.